This season we’ve assembled a team of six media members across the state to each select one player (or unit) each week. We will track the cumulative statistics of our selections throughout the season similar to fantasy scoring. Pittsburg is the only 5A member in the predominately 4A SEK League, and with a new quarterback under center, Barnes will be keyed on being the featured back in their offense. Barnes is the most talented running back in the SEK area in 2013. He rushed for over 1,000 yards last season as a sophomore, and expect a huge game for him against Labette County on Friday night. He ran a 4.5-second, 40-yard dash at Ohio State and Michigan camps this summer and with a big year could see some heavy D-1 interest. He has added good size in the off season and at 6-1, 208-pounds, he looks the part. We will find out what caliber of a player he is in district play against Eastern Kansas League opponents. Also expect a huge year for him on the defensive side of the football, as he registered over 100 tackles as a freshman two seasons ago. Delton has already emerged as one of the nation’s top juniors. He made multiple Division I trips this summer and Kansas State has already offered him a scholarship. Delton played in spot time as a freshman –mainly on passing downs – before he exploded onto the scene as a sophomore. The season opener against Junction City was when he first gained notice statewide. Playing on the road, Delton finished with 180 yards of total offense and five TDs accounted for in a 44-43 overtime loss. He eventually led Hays High to a 7-3 record, 4-0 in Western Athletic Conference play and its second straight playoff berth. Rivals.com has named Delton the No. 2 quarterback in the Class of 2015 and on its Top 250 list. Delton finished with 1,310 passing yards, 698 rushing yards and 28 combined touchdowns. This season, there are some questions about HHS’ wideout group after Adam Deterding graduated, but Hayden Kreutzer steps in as the top wideout. Kreutzer was Delton’s No. 1 target for an undefeated eighth-grade team. Hanover finished 9-3 last season with two narrow losses to rival B&B; a 52-46 double overtime thriller which ultimately decided the district championship, and a 50-20 state semifinal loss which sent the Baileyville to its fifth straight championship game. Last year, Hanover's varsity team was populated by a number of sophomores and juniors including Ethan Fritschi (6-5, 230, Jr.), Brandon Jueneman (6-0, 190, Sr.), and Wade Steinfort (6-1, 190, Sr.). They all return along the offensive front for the Wildcats this season. While replacing versatile running back and receiver Mark Zarybnicky will be no small challenge, the big men up front should allow new talent in the backfield to develop quickly. The Wildcats open the season with a Linn team that didn't post a win in 2012. The Trojans return offensive linemen Lukas Ferris, Mitch Saffle, Cody Patterson, Marquis Mitchell and Kenny Freeman and tight ends Matt Jones and Wyatt Jordan from a team that scored 40 or more points in every game last season. They will be blocking for several quality skill position players, including Kaden Vanderpool, Trey Irey, Josh Sowers, Jones and Jordan. Marais des Cygnes Valley will be facing a Hartford team it defeated 64-28 last year. Expect a big offensive game from the Trojans. Ryan Ralston (6-4, 220) triggers one of the most dynamic offenses in the Kansas City Metro. 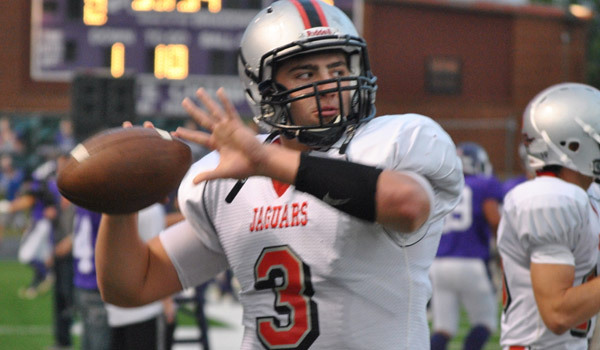 The senior quarterback will lead the Jaguars to play Washburn Rural this week and he could put up big numbers. Standout tailback Conley Wilkins graduated which could push the spread attack to go after teams through the air. Rosine (6-1, 211) is the signal-caller in the Panthers’ single wing offense. As a junior last season, Rosine led Centralia by rushing for 1,880 yards while throwing for another 600 yards. The Panthers finished as the Class 2-1A state runners-up after falling to Meade 28-25 on a couple of late touchdowns. Centralia returns nine starters on offense and all eleven on defense. The Panthers are a popular choice to win the 2-1A state title and open up their season at St. Marys out of the traditionally strong Mid-East League.